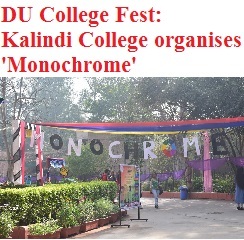 The Journalism society Sahaafat of Kalindi College organized its one day annual cultural fest, ‘Monochrome’ on the theme ‘Decode the Digital’ on February 23. Principal, Dr. Anula Maurya, while addressing the inaugural ceremony praised the Journalism Department for producing university toppers and elaborated on rank holders from the college and shared the some of the achievements of the students. The Chief Guest of the fest was Praveen Kumar, Arjuna awardee, celebrated character Bheem from the legendary TV series Mahabharata and luminary of Indian Athletics in 1960-1970 Asian games. The Guest of Honor was Vanya Joshi, Media Professional and Social Activist known for her acting in Sanshodhan and was the head of Casting Freemantle India inc.uk. The fest also witnessed presence of Rahul Makin (RJ Fever 104.8 FM) who graced the occasion as a judge of the RJ Hunt competition. Distinguished guests’ list included Shubhomoy Sikdar, (Principal Correspondent, The Hindu), O.P. Yadav (News Editor, Doordarshan), Tushar Mahajan (Director of World of Frames), Tarun Kohli (Theatre Artist at Khana Badosh) and Rohit Vats (Film Critic from HT), besides Dr. Durgesh Tripathi (Associate Professor) who also were judges of the various competitions held in the fest.